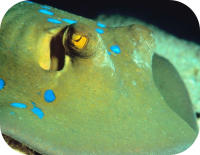 Rays are aquatic fish that have cartilage. Batoidea is a superorder of cartilaginous fish commonly known as rays and skates, containing more than 500 described species in thirteen families. Rays have a boneless skeleton made of a tough, elastic substance. With more than 500 species, rays come in a variety of shapes, sizes, and color. 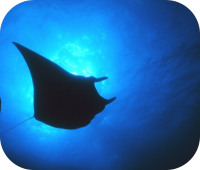 Rays have a wide variety of habitats, diets, and even varied methods of reproduction. Size: The Manta Ray is the largest species of the rays. The largest Manta Ray ever found had a wing span of 25 feet across! The smallest ray is the Short-nose Electric Ray. The Short-nose Electric Ray is 4 inches across and weighs only 1 lb. 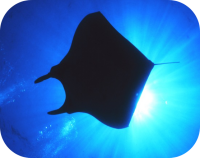 Habitat: Most ray species live on the sea floor, in a variety of geographical regions. The majority of rays are found in coastal waters, few live in deep waters. Diet: Ray species have varied diets, but all ray species are carnivores. Rays eat fish, crustaceans, mollusks, and worms. Rays mostly hunt on or near the bottom of the ocean. Description: Rays have a flattened body shape and an elongated tail. 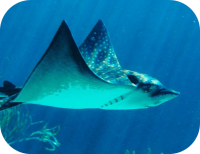 Many rays have spines on their tail which can poison other animals when stung. Some rays have long, whip-like tails, other species have short tails. 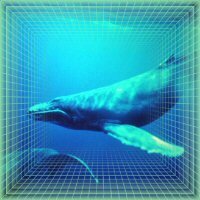 Life Span: The life span of rays varies from species to species. Rays have no bones, only cartilage. Athleticism: Rays are propelled through the water with their powerful, wing-like pectoral fins which ripple and flap.